Iain Boyd wrote: I am sure that the members of the HSofS forum would be interested in this collection. Will I leave it to you to make a posting, Arthur? Good idea, Iain. I have done so. What's even more awful is that the heralds rationalized the tincture violation not with the straightforward approach of describing the chief as "cousu" but by pretending that the partition is "per fess enhanced!" Can you please point to the exact spot where this supposed tincture violation is taking place. Certainly. An azure (or possibly bleu celeste) chief on a purpure field. The evasion of the rule is achieved by defining the shield as parted per fess. Why else would it be blazoned that way rather than as "purpure a chief nebuly?" Because it is too broad to be a chief. The blazon is quite clear - "Per fess nebuly enhanced Bleu-celeste and Purpure issuant in chief a Sun in Splendour Or in base three Bees volant proper." The College of Arms is the authority and if they call it Bleu Celest, that is what it is. Pretending that it is a different tincture doesn't help the argument at all. Chas Charles-Dunne wrote: Because it is too broad to be a chief. 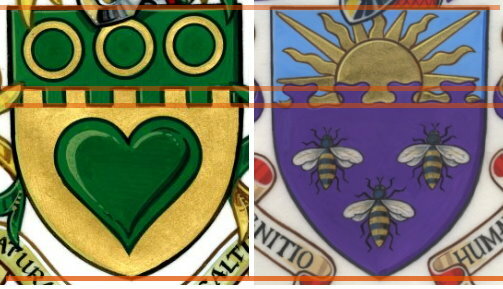 The blazon is quite clear - "Per fess nebuly enhanced Bleu-celeste and Purpure issuant in chief a Sun in Splendour Or in base three Bees volant proper." I wasn't pretending that it was a different tincture. I didn't go back and re-check what tincture was blazoned because it has no bearing on my point, which is that this is a colored chief on a colored field. And it is a chief, whatever the kings of arms called it. Surely you can't be serious in arguing that it is "too broad to be a chief." Because (a) there is no set proportion fixed for any ordinary, and (b) in any combination of color and metal no one would conceivably blazon it as other than a chief. In fact, if we compare the official emblazonment of these arms with the official emblazonment of another, newer coat also published in the CofA newsletter (arms of Raco, April 2015 issue), we can see that the placement of the partition line could practically have been traced from one to the other. The Raco arms, needless to say, are not blazoned as "Per fess embattled enhanced..." but "Or a heart on a chief embattled..."
I'm familiar with the argument that the king can do no wrong, but am not prepared to accept it as applying to kings of arms. Sophistry in blazoning doesn't change what the arms really are, and what the U of Manchester arms are is a colored chief on a colored field. If I were making the rules, there would be no problem with this, because the idea that a chief or other ordinary is "on" the field is wholly artificial. I find it absurd that "barry of six gules and azure" is permissible because the field is parted but "gules two bars azure" is prohibited because the bars are "on" the field. But the kings of arms are the one who made this rule. If they didn't realize that this coat violates it, they never would have weasel-worded the blazon. Whatever one's opinion of the tincture "rule" (the Nordics, to name but a few, would never have countenanced these arms), the juxtaposition of purpure, bleu celeste and or is simply horrid. Substitute sable for purpure and the arms are not that bad. Also on the vice-chancellor's robes. Note the coat of arms on the facings, with the crest on the left facing reversed. The College of Arms may not have been terribly thrilled with what they had to work with. Trying to combine (a) the blue chief from the VUM arms and (b) the university's corporate colour could not have been easy. One wonders how many draft designs were drawn, considered and rejected before they settled on the final compromise : sky blue to improve the contrast, and a "fess enhanced" to give the impression of a chief without actually saying so. Sometimes a Herald's life is "not a nappy one". I wonder why whoever designed the robes didn't think to have the arms and reversed arms on the opposite sides, so the crests would have been facing each other. Then they would have supported the V-C rather than trying to escape. Incidentally, surely the purple "house colour" of the university is the university's livery. That being so, there was no need to reproduce it on the CoA. The Tudor green/white livery was not reflected in the royal arms. Chris Green wrote: Whatever one's opinion of the tincture "rule" (the Nordics, to name but a few, would never have countenanced these arms), the juxtaposition of purpure, bleu celeste and or is simply horrid. Substitute sable for purpure and the arms are not that bad. But if the fess/chief hadn't been nebula it would be possible, even in the Nordic countries, as long as the sun is big enough to clearly divide the colours. Using bleu celeste would however not be accepted, and would be blazoned as azure, and purpure is certainly frowned upon. purpure is regarded as not being a colour or a metal in some heraldic realms, so there is no conflict with the colour rule in those realms.